Gain access to ready-to-use templates, well-designed charts, comprehensive statistics and ratings. 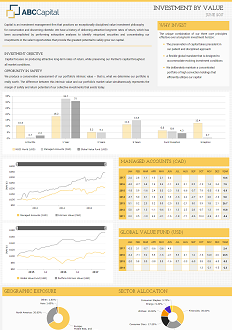 Automatically produce multilingual factsheets which meet local regulations and wow your investors. There are many beautiful ready-to-use factsheet templates available that will get you going in no time. We picked these using our 12+ years of experience in fund factsheet production. None of our standard templates suits your needs? 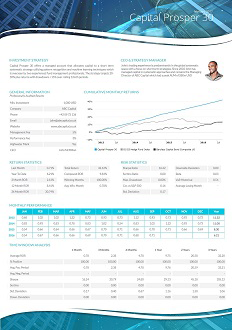 We’ll be happy to prepare a unique layout and design for your report. 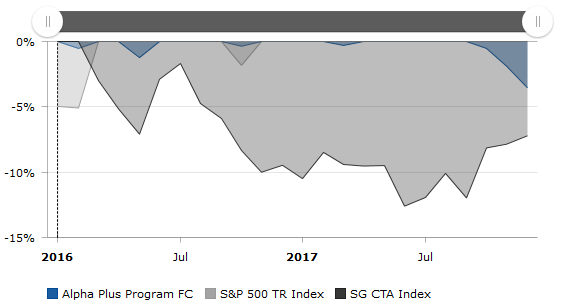 Pick which charts, statistics, benchmarks, program data or disclaimers to include. Feel free to rename all fields and change their location. There is a great number of tools which make a proper in-depth analysis very straightforward. 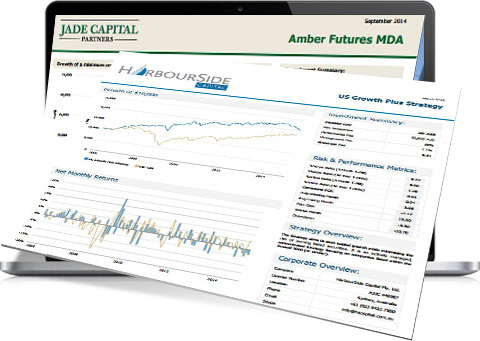 Choose from 80+ quantitative and 30+ qualitative fact files for each of your funds. No more boring numbers. With our dynamic charts, you can easily create powerful visuals to assist in telling your data’s story. Zoom-in and scroll. Easily adjust the dynamic charts to match your corporate colors. Engage your visitors, offer valuable insights, and make a simple site much more functional using TopSheets Widgets, embedded into the body of your website. The widgets provide you with additional functionality for your website while we deal with all the development. How do you properly upload the monthly performance? How are fees included in the results? Why does my logo not show up in the report? 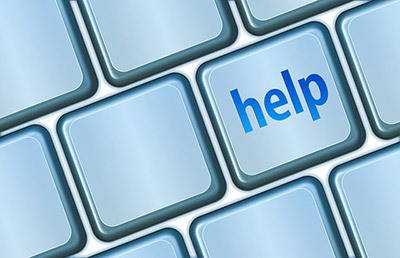 Our Help Center can provide answers to these, and many more questions regarding fund factsheet production. Thousands of indexes are also now available for your programs. All of them are up-to-date and have a full performance history. Charts and statistics will automatically adjust to the chosen index. Want to use Your Data in Other Applications? Do you have inhouse developers? Just use our API which gives you full access to all your data, calculations, statistics and charts. You can then include it any parts of your website or other applications. Contact us and we’ll provide you with a detailed documentation. All ready-made templates available in 5 major languages. Provide clients with factsheets in English, French, Spanish, German or Chinese. Just one click and your report is translated automatically. Use a local benchmark for comparison with your data. Meet local regulations. Use a fully customized and password-protected client portal to link individual clients to their reports. 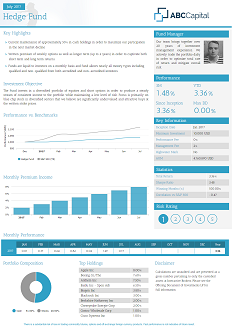 Manage client reports and your regular fund factsheets in a single user interface. Do you know your potential investors? Simply insert a Google Analytics code into your report and track your visitor activity. People want to know who takes care of their money. TopSheets supports the uploading of your personal photo into the report, which adds an extra personal touch. If you use TopSheets, you can create a connection to your live brokerage accounts. We then start automatically upload the statements and import them into our system for you to access. Manage your programs and portfolios easily in a single user interface. Easily add and remove programs, alter investment amounts, change allocation dates, choose between different calculation methods. Do you handle reporting for more than one company? You can easily switch between their profiles, directly in your master account. 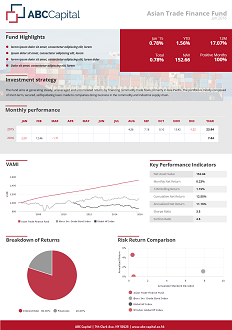 Make your fund information and statistics easily accessible for smartphone and tablet users by adding a two-dimensional barcode to the footer of your report. Are you afraid of losing data or failing to properly backup your reports? There is no need to be worried about that with our fund factsheet production application. 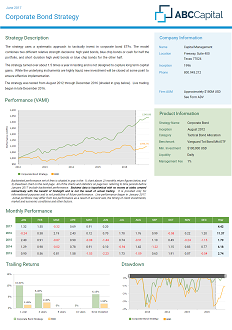 Simply store your beautiful fund factsheets directly in TopSheets. Not only does TopSheets use unique and secure URLs, but you can now also show your corporate domain name when the factsheet is loaded in a client browser.